As the water taxi whisked me over to Aruba's only private beach I indulged in a minor James Bond moment. The fantasy was prolonged by the frozen cocktail waiting for me on arrival and the group of exotic pink birds wandering around the powder fine sand on their namesake Flamingo Beach. OK, so I wasn't the only one on the boat or the beach and the ride had rendered my hair more dragged through a bush backwards than Bond babe, but if your idea of luxury is a slice of tropical paradise that's not as well-known as its larger big name Caribbean cousins then add Aruba to your list. The Caribbean's westernmost outpost, only 15 miles from the South American coastline, has a number of glitzy casinos and all too familiar fast food joints. But don't let that put you off as the small island, measuring up at 19 miles long and six miles across its widest point, has a unique heritage thanks to its Dutch roots. Although it's self-governing Aruba is still part of the Kingdom of the Netherlands and as we checked out the tempting designer shops in the capital Oranjestad we walked past colonial buildings painted yellow, blue, pink and an assortment of other pastel shades that reflect its history. Dutch and Papiamento, a jumble of different tongues including Dutch, Spanish and Portuguese, are the official languages although everyone speaks English. 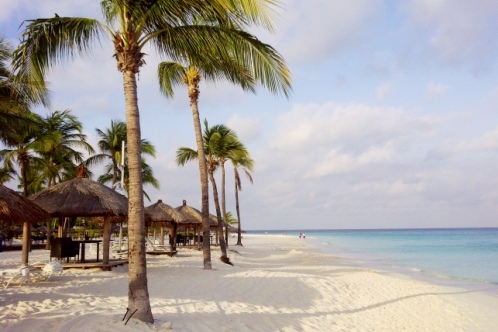 Situated outside the hurricane belt and with no real rainy season to speak of, Aruba's slogan is 'one happy island' and visitors get a warm welcome in every sense of the word. We didn't experience any of the hassle or see the noticeable poverty you encounter in some destinations. Hotels - divided between the buzzing Palm Beach area and quieter stretch of Eagle Beach - mainly fall in the four and five-star categories. A combination of all-inclusive, room only and bed and breakfast options mean you can keep the purse strings in check or blow the lot on a special occasion. The great thing about the Renaissance Aruba Resort, the only big hotel in Oranjestad, is that it has the best of both worlds with the family-friendly Ocean Suites and separate adult-only Marina Hotel, all intertwined with a fabulous shopping mall, restaurants, bars, a stylish spa and, if you fancy a flutter, a casino. After lunch we took the water taxi to the resort's 40-acre Renaissance Island, again neatly divided between Flamingo Beach for adults and Iguana Beach for families. For the ultimate treat you can have a spa treatment on the island and couples can book the Sunset Romance package complete with an open-air massage, bottle of bubbly and the secluded Spa Cove all to themselves for a few hours. Sadly they dynamics of our girlie group precluded us from staying at the beautiful Bucuti Beach Resort, a chic retreat for couples on a tranquil stretch of Eagle Beach. A walk along the sand revealed its private dining cabanas and restaurant terrace overlooking the sea and the entertainment programme includes movie screenings under the stars. A couple were getting married on the beach as the sun dipped over the horizon and it was easy to see why it's a magnet for honeymooners and anniversary couples, who find personal congratulatory messages on their doors. Although it would be easy to stay put on Aruba's beaches, and doubtless many do given the toasty year-round temperature of 28C, we booked several excursions. Whilst not for the faint hearted, a highlight was the half-day jeep safari where we bounced down precipitous tracks to the Natural Pool on the rugged northern coast which attracts thrill seeking windsurfers. Surrounded by steep rocks we scrambled down to take the plunge in the sea water pool (those of a braver disposition can jump in). Enveloped in towels we then braced ourselves for the drive back up before touring Arikok National Park with its towering cacti, caves and wandering herds of goats. On our travels we came across brightly coloured iguanas soaking up the sun, the prolific aloe vera plants that feature in many of the island's spa treatments and Aruba's idiosyncratic divi-divi trees that are permanently bent by the trade winds. One day we headed to Baby Beach, set in a sheltered cove on the island's western tip, which is popular with locals and named after the safe waters that make it perfect for children. Whilst the backdrop of the island's oil refinery was rather incompatible with the rest of the scene we soon forgot about it as we donned snorkels and dipped our heads into the water to watch shoals of fish that could easily be spotted a short distance from the shore. A legend in her own lunchtime is Loutiza Raven who runs Big Mama's grill on the beach, serving home-made burgers and cold beers. When it's time for more sophisticated fare, coupled with fantastic views of the sunset at no extra cost, top spots on the island are the circular Windows on the World restaurant at Divi Village Golf & Beach Resort and the Italian El Faro Blanco Restaurant by California Lighthouse on the eastern end of the island. We were in town for a Sunday night institution, the sunset party at Moomba beach bar, an inclusive get together for all ages with live music and a happy hour from 6pm to 7pm. For another fun night out hop along to Senor Frog's, one of the many restaurants and bars lining the Palm Beach area. As we weighed up the pros and cons of a Poisonous Frog cocktail (rum, vodka, gin, tequila, amaretto and red wine all come into the potent mix) the waiters cast an astute eye around our table and returned with an assortment of large word bubble signs which were duly placed behind the likeliest looking recipients. Mine read 'Single and looking'. Anyone seen Daniel Craig?